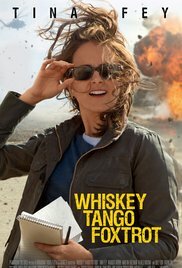 Some scenes in the new movie Whiskey Tango Foxtrot, starring Tina Fey, features scenes shot at the Santa Fe, New Mexico Scottish Rite Center. 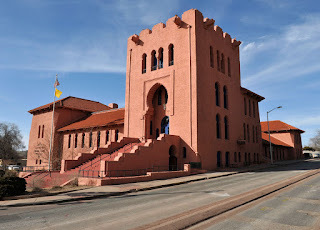 It is the home to several Masonic bodies, including the Scottish Rite Valley of Santa Fe, a Shrine club, an OES chapter, and Montezuma Lodge No. 1. The unique and historic building was put up for sale in 2013, but a year later, area Masons changed their mind and took it back off the market. That's good news for us preservationists in the fraternity, but that means lots of hard work and fundraising on a large scale if the beautiful structure is to remain in the hands of Freemasonry. Location fees from the film production company were a nice boost for them. The Rite will hold an open house for the public on Saturday, and will feature a public (and heavily reworded) demonstration of Masonic ritual, called a "Lodge of Friendship" ceremony. It's an interesting idea, and I suspect it was designed to show the public that Masons aren't up to anything creepy in our lodges. I'd love to hear what the public response to it, as well as get feedback from participating Masons as to whether it is a good strategy. The film is based on journalist Kim Barker’s memoir The Taliban Shuffle and recounts her wartime news reporting from Afghanistan and Pakistan beginning in 2002. Standing in for some of the south-central Asia locations is the Scottish Rite Center in downtown Santa Fe. Movie crews are long gone, but the public will have a chance during an open house Saturday to explore the Scottish Rite Freemasons’ landmark Moorish Revival pink building, which was finished in 1912, the year New Mexico became a state. The building, on Paseo de Peralta at Bishops Lodge Road, recently appeared on the real estate market, but the Masons are now trying to keep it open as a hub of community activities, including as a site for film and TV productions. All Masonic lodges in the state will open their doors to the public Saturday. Presentations about Freemasonry at the Scottish Rite Center will be held at 10:30 a.m. and 12:30 p.m.
Masons will offer tours of the pink building all day. Visitors will see the costumes, symbols and parts of rituals associated with Freemasonry. Women from the Freemasons’ Order of the Eastern Star also will be on hand to answer questions and display some of their symbols, and in the lodge museum, the Masons will exhibit a Will Shuster painting and a 150-year-old Hawken rifle that had been owned by Kit Carson. A special event at Saturday’s open house will be the Lodge of Friendship ceremony in the Montezuma Lodge west of the Scottish Rite Center. The mock ritual will be similar to those practiced by the Masons, but it won’t divulge any of their biggest secrets. The script calls for observers to be given the word fidelio and be asked to repeat it, proving their “intentions are pure” and that they are there for “the purpose of friendship and brotherly love.” Mason John Adams said this is akin to passing of the peace in a religious service. Freemasonry, an ancient society, came to Santa Fe in 1847 with the 3rd Regiment of Missouri Volunteers who were fighting in the Mexican War. The Montezuma Lodge was chartered in 1851, and it petitioned with three other lodges in 1877 to create the Grand Lodge of New Mexico. Today, the Montezuma Lodge has 185 members. 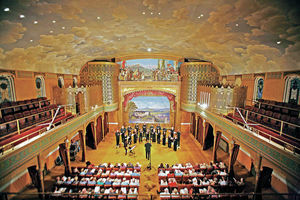 Some of the most famous men in New Mexico were members of the society, including Thomas Benton Catron, the first U.S. senator from the state who was a “worshipful master” in 1883; Carson, the trapper and scout; Solomon Spitz, a watch repairman; Gustave Kaune, owner of Kaune’s Food Town; Willi Spiegelberg, a prominent 19th-century merchant; John Gaw Meem, designer of some of the city’s famous Pueblo Revival buildings; Shuster, creater of Zozobra, and Harold Gans, the voice of the giant marionette for 40 years. Many famous Americans also were members, including George Washington, Benjamin Franklin, Franklin Roosevelt, Mark Twain and moon-walker Buzz Aldrin. Adams, treasurer of the board of the Scottish Rite Center’s holding corporation, created in 2014, said it costs about $500 a day to keep the building open, and it currently is in the black. But declining membership in the Freemasons and shaky finances in recent years have threatened its future. In April 2013, the 44,000-square-foot building was put on the market for $8.4 million. The price was lowered the following year to $6.9 million. But in 2014, some of the members reconsidered the decision to sell, and the property was pulled from the market. In August, Adams said, the Masons reached an agreement with Sotheby’s, which had brought at least one offer to the table, to terminate the listing. Since then, the group has worked hard to market the venue for weddings, benefits, performances and other activities, as well as in building its relationship with groups such as the local film technicians union. Fey’s movie was a bit of a “windfall,” Adams said, and the Masons are hoping for another like it. Adams said the center’s kitchen will be converted into a morgue for an episode of the modern Western TV [A&E network] crime drama Longmire, but he did not know about any other filming on the horizon.